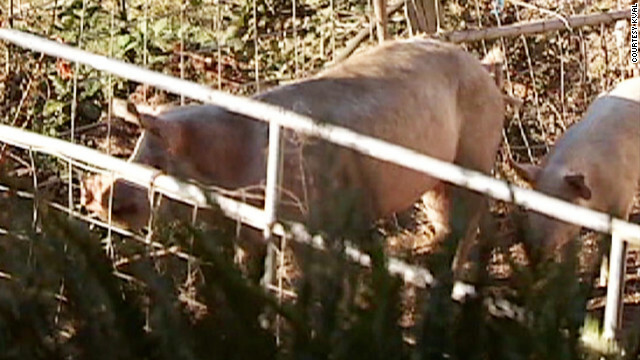 Authorities in Oregon are investigating how a hog farmer was eaten by his animals. The remains of Terry Vance Garner, 70, were found in his hog enclosure Wednesday, according to local news reports Monday. The farmer had gone to feed the hogs, some weighing as much as 700 pounds, about 7:30 a.m., according to a report from CNN affiliate KMTR. After Garner was not seen for several hours, a family member went to check on him and found his dentures in the hog pen. Other remains were found, but the hogs had eaten most of the farmer, according to the report. The sheriff's department is looking into the death. "Due to the unusual circumstances, the Sheriff's Office is investigating to determine if foul play may have resulted in the death of Mr. Garner," Coos County District Attorney Paul Frasier told CNN affiliate KVAL. “For all we know, it was a horrific accident, but it’s so doggone weird that we have to look at all possibilities,” the Eugene Register-Guard quoted Frasier as saying. Garner could have suffered a heart attack and fallen in the pen, or the hogs could have knocked him off his feet and then eaten him, Frasier told the newspaper. The state of the remains made determining a cause of death difficult, according to the news reports. They had been sent to the University of Oregon and examined by a forensic anthropologist, the report said. The farmer's brother, Michael Garner, told the Register-Guard that one of the sows had bitten the farmer last year after he accidentally stepped on a piglet. “He said he was going to kill it, but when I asked him about it later, he said he had changed his mind,” Garner said. Garner told the Register-Guard his brother was a Vietnam veteran who suffered from post-traumatic stress disorder. The farm was "a life-saver," he said. “Those animals were his life,” Garner told the Register-Guard. Makes you think twice about Miss Piggy. Of the Golden future time! Those who like good legislation and good sausage should not see how either are made. I had NO idea that pigs were vicious animals, that they would attack a human or even that they had a taste for meat. Not to mention eating the person that fed and cared for them. This is weird on so many levels. This little piggy went "wiii.wiii,wiii"
Pigs with a taste for long pig... oh the irony. Sounds a lot like a murder cover up to me, but who knows. I`m glad i stopped eating pork years ago.